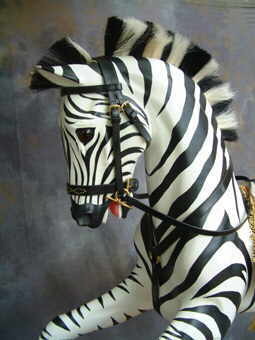 to see more rocking horses and information. Acclaimed as the finest rocking horse maker in the UK, Legends Rocking Horses make exquisite Georgian and Victorian style hand-carved wooden rocking horses reflecting realism, elegance and a feeling of movement appealing to adults and children alike. Our horses are all hand-carved using traditional carving tools which enable us to achieve in-depth and shapely carving detail. With their heads turned to one side and friendly facial expressions our horses are beautiful works of art suitable for riding or as an ornamental sculpture. All our rocking horses are constructed in hardwoods using the very best of the Victorian techniques to ensure they take the weight of adults and their longevity is assured. We offer a very wide range of wooden horses in both natural wood or painted finishes and the photographs throughout this website illustrate a small selection of rocking horses our small family business has made over the last couple of decades. Although we always have horses available from stock most of our rocking horses are individually commissioned to enable you to own a unique family heirloom of the very highest quality - rare collector's items for present and future generations. More information on styles and options for customising your horse is available on our Sizes and options page. 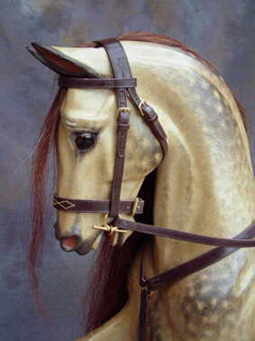 Legends also sell restored antique rocking horses by sought after makes such as F.H. Ayres and G&J Lines. We are specialists in the sympathetic and authentic restoration of old and antique rocking horses and even the most dilapidated of horses are transformed to their former beauty and usability. We also make outstanding replicas of the very best of the antique rocking horses we have encountered over the years which can be finished in a variety of ways to look new through to a realistic aged effect. 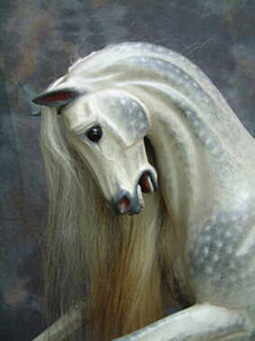 We also welcome special carving commissions such as carousel horses and unicorns. Please see our Carousel section for more pictures and information.